Well I thought about this project for a few nights and tried to figure out just how it work in my head and I finally decided to just sit down and start. And this is the result. 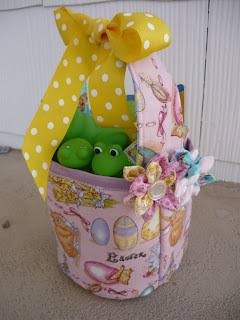 A cute fabric Easter basket. I decided to include a tutorial with this post. I hope that someone else can be inspired from this project to make the same thing or something similar. Enjoy!! 4 circle pieces 7 1/4" in diameter. 2 out of the heavy weight stabilizer, and two fabric. These are my 4 side pieces. 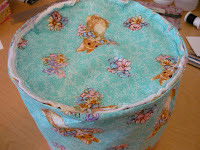 Step 1: After all your pieces are cut you want to put the piece of the stabilizer and fleece for the side of the basket together. 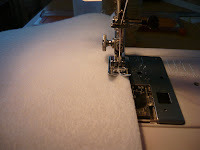 You can fuse the fleece to the stabilizer if you want then sew around all the edges with a 1/4" seam. 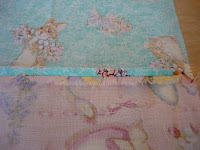 Step 2: Take the 2 fabric side pieces and put the right sides together. 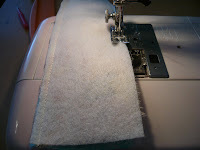 Sew a 1/4" seam along one long edge. Back stitch at the start and stop. Press the seam open. 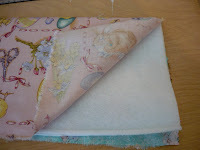 Then turn the fabric right side out wrong sides together now and press the seam flat. 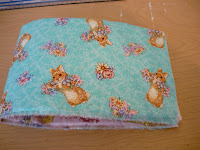 Step 3: Now take the stabilizer/fleece piece and slip it inside the fabric side piece. 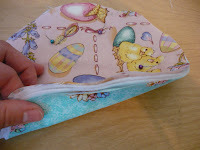 Pin the bottom (open) edge and sew a 1/4 inch seam. (This will have an unfinished edge but it will be sewn to another piece later. I ended up with the unfinished edge on the inside bottom of my basket which didn't bother me). 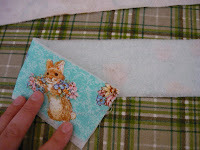 Step 4: Next I wanted to sew something through the middle of this piece to give it a quilted look. I marked off angled lines to form triangles. I marked these with pins and then sewed. This means you have to eyeball your seam. If you want, you can lightly draw a line with a fabric pencil. 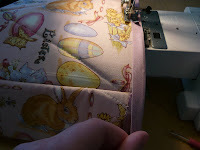 (The stitching lines are visible in these pictures because I took the pictures after I sewed the lines) Start sewing at one end, sew down to the pin, pivot (leave needle down in the fabric and lift the presser foot and turn the fabric) and sew up to the next pin. Repeat until you get to the end. 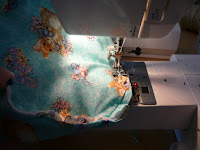 Back stitch start and stop. Step 5: Bring the two ends of the side piece together with whatever side you want as the outside of the finished basket, on the inside. 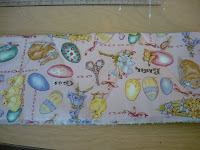 Pin the end and sew a 1/4" seam. Step 6: Turn the side piece right side out now. 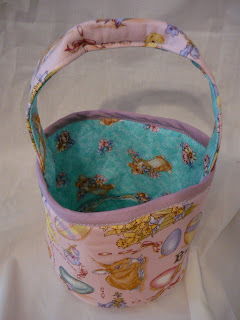 I decided that I wanted to put some trim around the top of my basket. 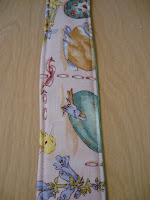 I had some bias tape that I decided to pin around the top and stitch down with a zig zag stitch. Because the top edge is finished you don't really have to put any decoration on it if you don't want to. 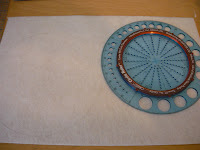 Step 7: Cut out your bottom circle pieces. I traced a circle drawer that I had that was the perfect size. You want the bottom circle pieces to be slightly bigger around than the side piece. 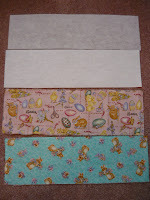 Put all 4 circle pieces together (fabric, stabilizers, fabric [fabric has the right sides out]). 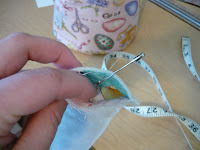 Sew a 1/4" seam around the outside edge of the circle, back stitch start and stop. Step8: With the wrong side of the basket side piece out, pin the bottom circle to the bottom edge (right sides together). It is important when pinning circles together to know that it is very hard to avoid some bumps and tucks. I have just come to accept these as part of the process. 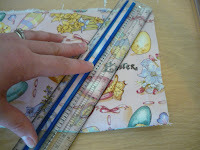 Sew around the edge again with a 1/4 inch seam. 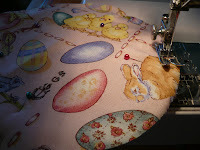 Remember back stitching. The finished product. I trimmed my seam allowance down as close to the stitching as I could. Step 9: Make the handles. Cut out your 4 handle pieces. 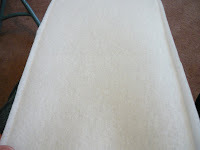 Fuse the fleece to the wrong side of the fabric pieces. 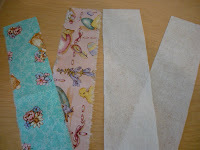 Place the fabric pieces right sides together and sew a 1/4" seam down both sides. Step 10: Turn the handles right sides out. 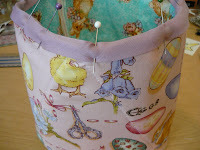 Place a safety pin through one end of the handle piece near the top but down about a 1/2". 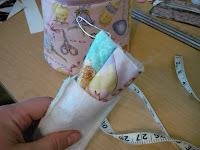 Push the pin down inside the handle piece and scrunch the fabric, then pull down the pin and repeat until the safety pin comes out the other end. Pull on it until you have turned your handle piece right side out. Press it flat with an iron. 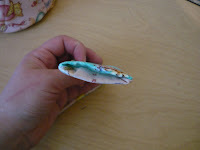 Fold the ends (both ends) inside about a 1/2" and press. 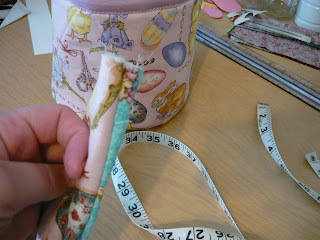 Top stitch (1/8" seam) down each side of the handle piece. Step 11: Place the end of the handle on the inside of the basket. 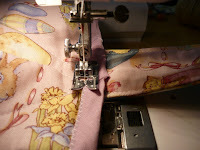 Pin in place and sew remembering to back stitch. 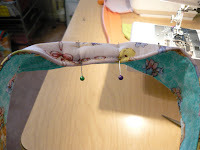 Find the direct opposite side of where you sewed the handle in place and pin the other end of the handle and sew as well. Step 12: Finally to make the handle easier to grip fold the center part of the handle in half and pin. 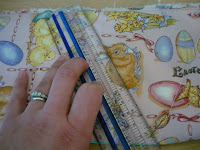 Sew along the existing stitching (about 2 inches ). 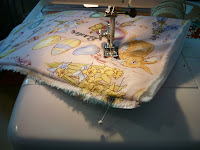 Back stitch start and stop. Tada!!! You have a basket. The last thing to do is embellish. 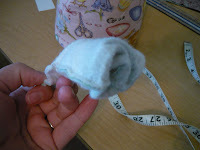 I made these cute fabric flowers that I found a tutorial for on Sew Ritzy~Titzy She does an amazing job with her tutorial so I will not repeat it. I made one large flower for one side and 2 small ones for the other. 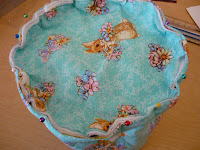 After adding those I felt like the basket needed a bow so I sewed this polka dot one on. I can't decide if I like it or not. What do you think? 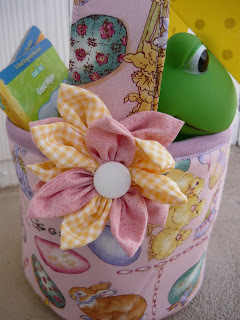 Now you have a cute basket that your child can sit on and scrunch up and it won't break or be ruined. A great keepsake. Wow! You explained that so well, I love this tute! I'll be linking, I can't wait for Easter! Now be honest on a scale of 1-10, 10 being hardest how hard were these to make. Keep in mind I am very much a beginner. Love it! For Katie or anyone else wondering on a scale of one to ten with ten being the hardest I would say this is a 5 or 6. 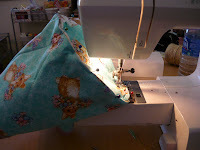 It has basic sewing steps, mostly straight lines and the circle for the bottom. The bottom would be by far the hardest part of the whole thing. But not impossible. When I was teaching high school sewing I had my students do circles (they were really beginners) and they all turned out fine. I think the main reason I would say it is a 5 or 6 is because I would worry if my instructions were clear enough. It is hard to put something that you could say without a problem into words that are typed. Hope I included enough details. I wouldn't be afraid of the project. Just make sure you allow yourself time to work on it. It does take a little time. I hope someone tries it. Wow oh Wow oh Wow! This is awesome! 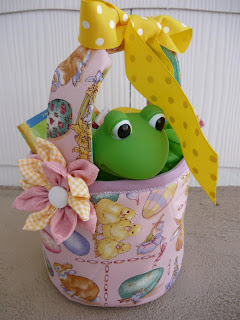 I can't wait to made dd one for Easter! This is exactly what I was looking for. 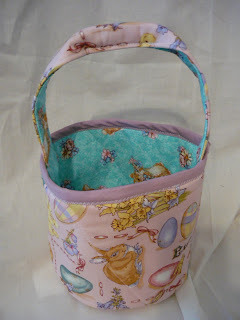 Pottery Barn has a fabric Easter basket out right now, but the colors didn't appeal to me. 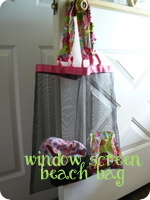 Thank you so much for providing the instructions so that everyone can enjoy such a beautiful idea! Thanks for such a great tutorial. I am still a beginner but was able to finish one for my daughter and am confident I can finish one for my son as well. 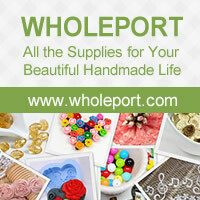 Its great to give them something unique and made with love instead of something bought. I love this! 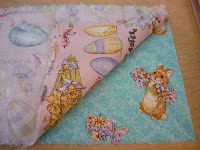 I made this for my niece for Easter and then I am also going to make one for my daughter. Thank you so much for all of the pictures and instructions! Finished!! 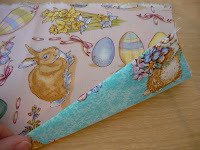 (Easter Eve;) Thank you, thank you, thank you for the tutorial! Just what I needed! I just made this basket and it turned out great. Thanks so much for the tutorial! This came out wonderful. 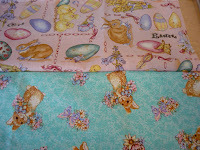 Easter is one of my favorite holidays, and you got some really adorable fabric. I'm trying to resist the temptation to make some doll sized ones for my daughter's American Girl dolls. I love it! The directions were so easy that I actually felt brave enough to make it. There were a few flaws (I'm totally a beginning sewer), but I'm thrilled! I made a Batman one for my son and flower one for my daughter! THANKS!!!! Thank you so much.You did a fabulous job on you tutorial. It was very easy to follow. 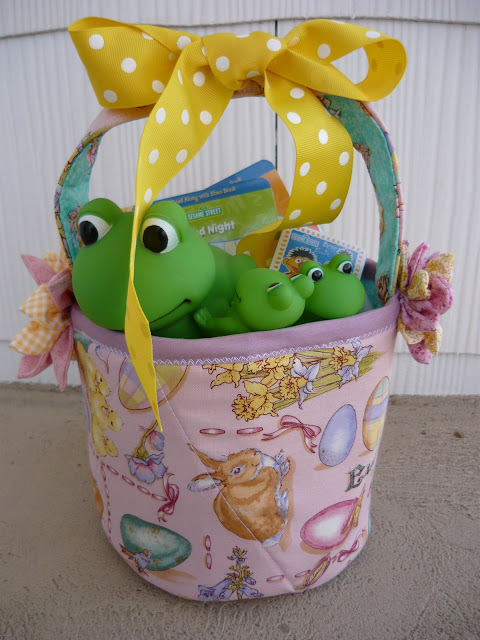 I made your Easter Baskets last year for my three grandchildren. When my son and daughter-in-law saw them, they wanted one for collecting eggs. 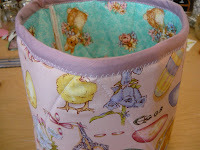 When my daughter-in-law's friend saw her egg-collecting basket, she wanted one too.You made a lot of people happy! I'm actually trying this right NOW! But I'm deathly afraid of the circle so I'm making the whole thing square. Hoping it turns out as cute as yours. I am going to make these for my grandkids. They are so cute. Love the flowers for my granddaughter. Will have to think of something different for my grandson, maybe a pinwheel if I can figure it out!